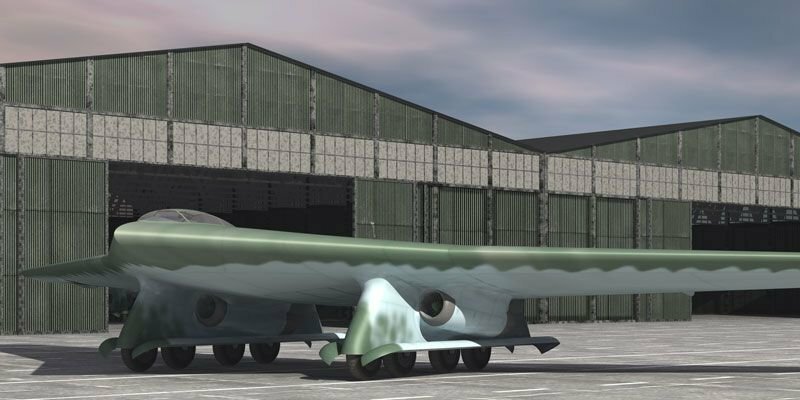 Designed by the Horten brothers, Walter and Reimar, The futuristic Horten H.XVIII Amerikabomber was one of the last aircraft designs the Horton brothers made for Germany. The H.18 was designed to fly from western Europe to the east coast of the United States and back. 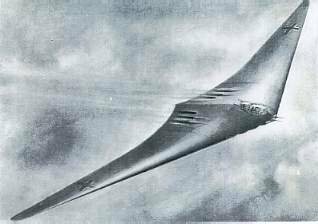 The bomber resembled the more well-known Gotha 229 (also designed by the brothers) the wingspan would've been 131 ft wide and powered by six Jumo 004 turbojets. Like the 229, the engines were to be built within the main fuselage section to decrease drag unlike most German jets at the time. It would have a crew of three, be equipped with four 151 machine guns, top speed of 515 mph and carry 8,818 Ib of bombs. The aircraft impressed Reichsmarschall Herman Goring, he was interested in flying wing designs and thought they would be the future of aircraft. If the aircraft was built and succeeded in bombing the United States, Goring knew that would have huge propaganda value. He told the brothers to share their designs to Messerschmitt and Junkers engineers. To their dismay, the engineers decided the design was flawed and suggested adding a rudder fin, underwing turbojets and landing gear pods. The result was the H.18B (second picture). The B version had four HeS 011 engines and two pods with clamshell doors each having 4 wheels. Goring liked this design more and the construction of the aircraft was to be done in large concrete hangars and the construction of special runways for it were to start in the Fall of 1945 but the war ended too soon for any more progress to be made.